Born in the lush and beautiful state of Washington, author Amber Richards has always been surrounded by inspiration. She has been writing and creating for as long as she can remember and today still calls the Pacific Northwest home. Amber’s books span a multitude of topics, but all have one thing in common. Her love of nature, children and family are the basis of each, and her passion is apparent on every page. Most recently she has added watercolor artist to her catalogue of talents, and needs only to gaze out her window for daily motivation. When Amber isn’t breathing life into a new book or painting, she is surrounded by a loving family. She is the proud mother of two children and enjoys every moment she spends with her five grandchildren. 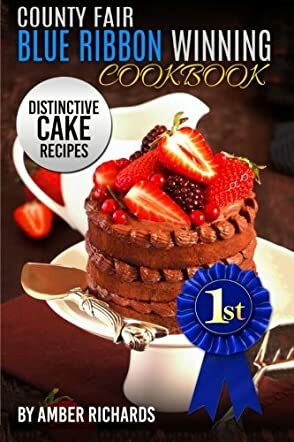 County Fair Blue Ribbon Winning Cookbook: Distinctive Cake Recipes (Volume 2) by author Amber Richards is packed with prize-winning cakes that will make your mouth water! Included in the book is a vast assortment of cake recipes, including classic favorites such as Coconut Cream, Carrot Cake, Pineapple Upside Down Coffee Cake, Chocolate Peanut Butter Cake, and Rich Chocolate Cake. In addition, the book features unique cakes such as Berry Tunnel Cake, Whoopie Pie Cake, and Tropical Angel Food Cake. In the introduction, the author includes a handy recipe converter that helps the reader understand the measurements listed throughout the book. Also, different pictures of cake pans are shown so the baker knows if they should use a Bundt pan (and what that pan looks like) or a fluted cake pan. There is a picture of a crystal cake display stand as well, in case you would like to display your award-winning cakes! The recipes included in County Fair Blue Ribbon Winning Cookbook: Distinctive Cake Recipes (Volume 2) are simple enough for most home cooks and bakers, with steps including the use of double boilers, electric mixers, food processors, and other common kitchen items. There are a few photographs of the cakes here and there, though I was a bit disappointed that there were not pictures of each cake listed in the book. Still, author Amber Richards does a terrific job of listing ingredients clearly with easy to understand steps and instructions. I’m definitely looking forward to trying these recipes, and I recommend the book to home cooks, bakers, and anyone who wants to try a new cake recipe.